ST. LOUIS (AP) Even after such an impressive outing, Jack Flaherty just wanted to talk about his hitting. Flaherty struck out a career-high 13 to earn his first major league win and Tyler O’Neill homered as the St. Louis Cardinals beat the Philadelphia Phillies 5-1 on Sunday. Making his ninth big league start, Flaherty (1-1) gave up only two hits and walked one in 7 2/3 dominant innings. But after throwing 120 pitches, all the rookie right-hander had on his mind was his first hit in 10 at-bats – a relatively meaningless single in the third. Jordan Hicks got four outs to finish the two-hitter and threw the fastest pitch in the majors this season, according to Statcast – a 105 mph fastball to Odubel Herrera in the ninth. Hicks hit 105 mph twice and 104 three times against Herrera, the five fastest pitches in the big leagues this year. O’Neill, who had three hits in the cleanup spot, homered for the second time in two games. His solo shot off Aaron Nola (6-2) in the sixth made it 3-1. Flaherty was called up Tuesday from Triple-A Memphis when Cardinals starters Adam Wainwright and Carlos Martinez went on the disabled list. He became the 13th pitcher to strike out at least 13 in a game this season. Flaherty’s total marked the most by a Cardinals pitcher since Martinez fanned 13 on Aug. 29, 2016, against the Braves. 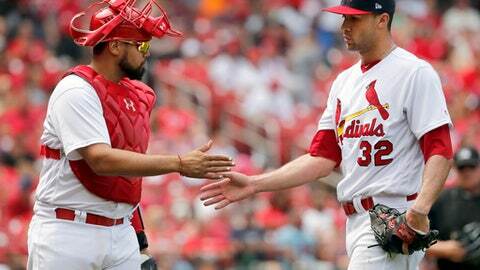 ”I looked at him and he gave me a dirty look and I thought that was perfect,” Matheny said.